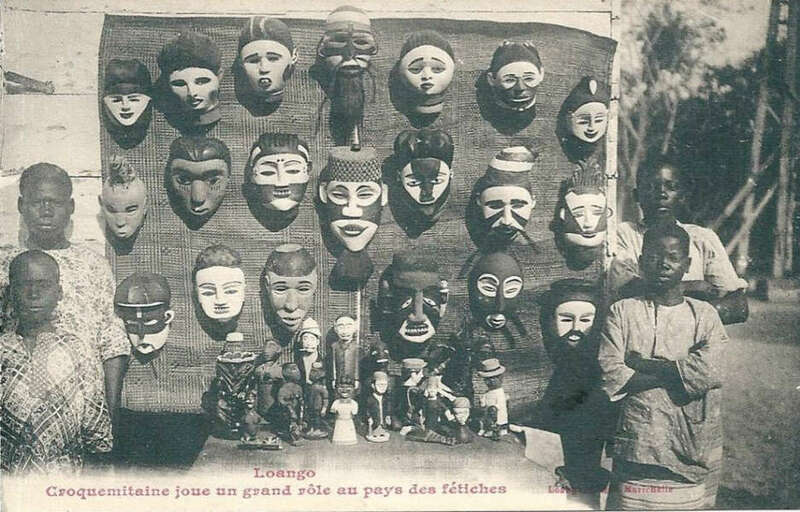 A perfect example to show how early on objects were intentionally carved for passing tourists, the above postcard from around 1910, shows a Loango market stall with Kongo-inspired masks and figures made for sale. Already from the 2nd quarter of the 19th century the Northwestern Kongo people produced decorative art (some of it derived from ritual art) for export, alongside ritual and decorative art for their own use. By the end of the 19th century making art for outsiders had become an additional source of income for Kongo artists and during the first half of the 20th century, making art for colonials was their main occupation because traditional clients had almost disappeared. Just to say, that age alone, can never be a sufficient parameter to classify an object as authentic. This entry was posted in Research and tagged Kongo on May 30, 2014 by admin. Earlier this month BrunoClaessens.com silently celebrated its first birthday. 230 blog posts later, the site has been visited more than 40,000 times from 139 different countries. Currently at 280 daily visitors, I’m very happy with its success. Thanks everybody – especially for putting up with my faulty English. Upcoming is a new & improved way to browse the labels & inscriptions, but more on that later ! This entry was posted in News on May 28, 2014 by admin. With a total result of $ 5 million (including buyer’s premium), the second part of Sotheby’s sale of the Allan Stone collection failed to outperform the first part (reviewed here) – which did more than twice as good at $ 11,5 million. The statistics don’t give a very positive image: of the 91 African art lots, 38 (or 42 %) sold below the low estimate – a sharp contrast with the first part last November, were 65 % of the sale sold above the high estimate. Additionally, 14 objects failed to sell. 14 objects sold within their estimate and 25 (or 27,5 %) above their high estimate. By lot, 85 % was sold (not much less than the 94 % in the first part), but in almost half the cases below the estimate; and with 10 lots at half the low estimate. Luckily for Sotheby’s, the reserves apparently were rather low. Next to the fact that the estimates might have been too steep, there wasn’t much action in the sale room either. In comparision with the first part, not that many European dealers were present. Due to the lack of exuberant record prices, I had the feeling not as many collectors from other art segments were bidding either. I guess the African art market just got a little bit smaller again. Besides, there’s a limit in what this small niche market can absorb within a certain period of time. The total low and high estimate of the sale were (roughly) $ 5,6 million and $ 8,5 million. With a total result (without premium) of a little less than $ 4 million it is clear this sale was not good. The main reason appears to be the fact that almost all top lots didn’t sell as good as was expected, or not at all. Important lots that failed to sell were the Kongo-Yombe figure (lot 47), estimated at $ 700K-1,000K it was passed at $ 420K and a Songye figure (lot 70) (estimated $ 600,000-900,000) which failed to find a buyer at $ 460,000. Other top lots didn’t do very well either; the back cover lot, the Kongo figure from a known hand sold below its low estimate at $ 440K (without premium) – Sotheby’s clearly had much higher hopes for this one, but the three pages didn’t help. The Kongo-Vili janus dog figure (lot 55), estimated $ 150K-250K, sold for $ 95K (excl. premium) . 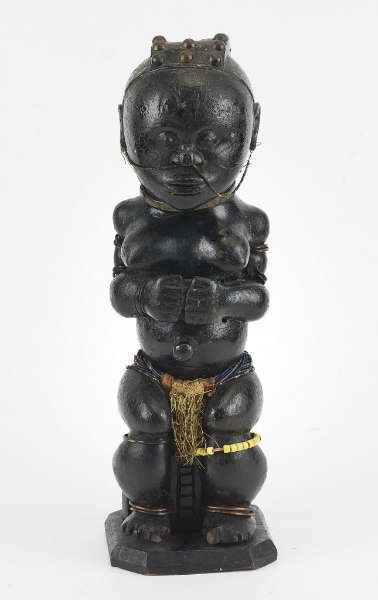 Another Kongo figure (lot 57) sold for $ 300K (without premium), $ 100K below its low estimate. Another three-page lot that didn’t perform as expected, the Songye figure from the cover (lot 67), estimated at $ 1,000,000-1,500,000, sold for $ 800,000. No objects in the sale succeeded in selling above the one million dollar mark. The aforementioned Songye came closest, with the premium included, at $ 965,000. The only Songye figure that did ‘well’ was lot 77, which sold in the middle of its estimate at $ 400K (without premium). A lot of objects sold at their starting bid (often half the low estimate) with only one interested party: lot 19, lot 26, lot 27, lot 34, lot 35, lot 37, lot 56, lot 64. 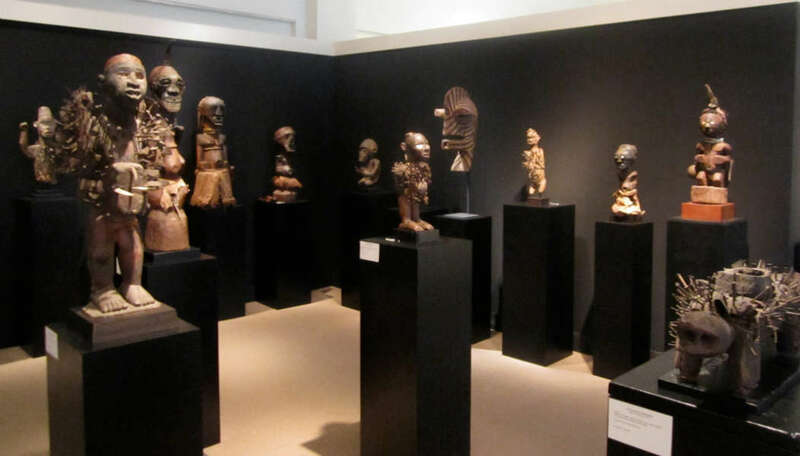 Some of these were real bargains, for example an Ejagham panel (lot 25) sold for $ 15K (half its lowest estimate) and a magnificent Urhobo figure at $ 30K (again half the estimate). 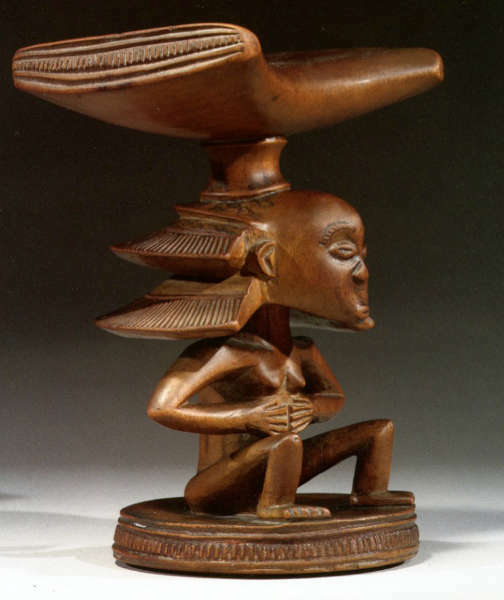 There weren’t that many surprises in the sale: a big Senufo horse (lot 12), estimated $ 4K-6K, sold for $ 30K – after all a rare type of object; a nice Asante stool sold for $ 11K (with an estimate of $ 3K-5K); a seated Kongo-Yombe figure (lot 59) sold for $ 55K (estimated $ 6K-9K) and an “Eastern Congolese” figure (lot 66), estimated $ 15K-25K, sold for $ 60K – clearly some people knew more about this mysterious figure. 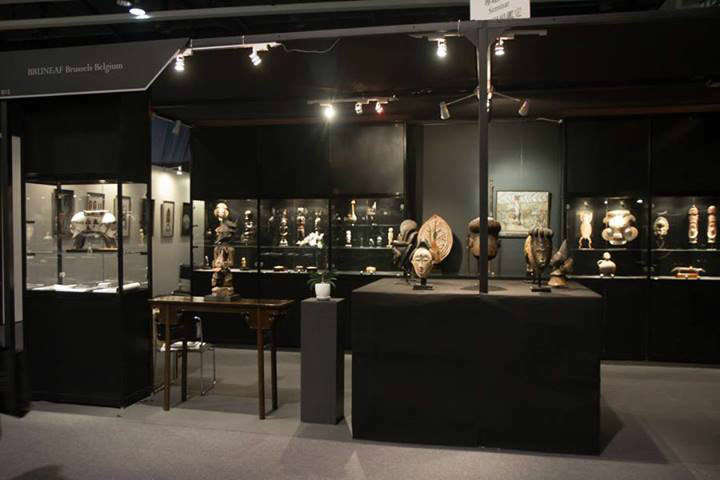 Lastly, two personal favourites did very well: the rare Bidjogo ‘figure’ which sold for $ 90K to a New York dealer and the expressionistic Makonde mask, which sold for $ 9,000 – a steal. This entry was posted in Auctions, News, Opinions on May 27, 2014 by admin. A group of Hungana ivories acquired from Umlauff in 1912. Image courtesy of the Penn Museum. Though not very well known, the African collection at the Penn Museum is one of the largest collections in the US. This collection includes approximately 15,000 ethnographic and 5,000 archaeological objects and most of the collection was obtained between 1891 and 1937. A large part was purchased in 1912 from pioneer African art dealers like William O. Oldman from London and J.F.G. Umlauff from Hamburg. 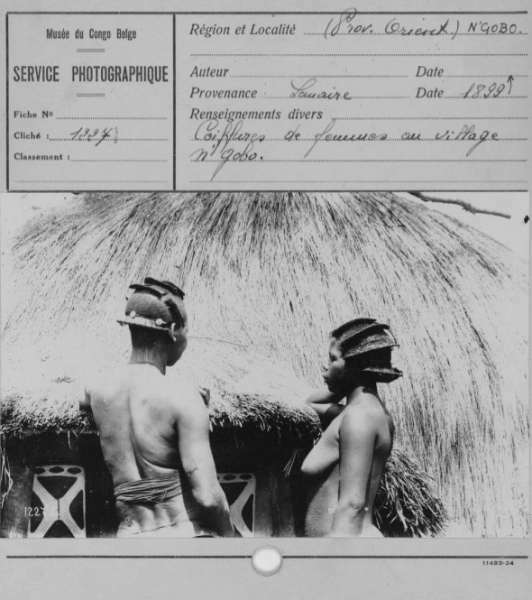 About 3000 objects were collected in the Belgian Congo by the German ethnographer Leo Frobenius on his expedition to the Kasai district in 1906. 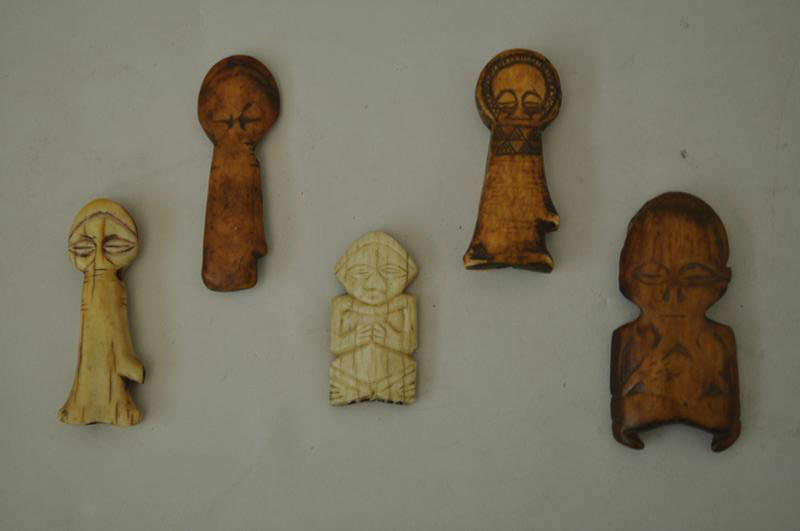 A smaller group of 89 objects was collected by Emil Torday in the same region. Additionally, the Penn Museum also has one of the most extensive Sherbo Island collections in the world. Collected by H. U. Hall during a University Museum sponsored expedition (1936-37), these 700 objects related to the Poro Secret Society and the Sande secret Society from Sherbro Island are meticulously documented. Lastly, in 2003, the museum acquired a gift of 1500 artifacts from the Philadelphia Commercial Museum (also known as the Philadelphia Civic Center Museum). Many of the objects in that collection were exhibited at the Paris Exposition Universelle Paris 1900 and the French Colonial Exposition of 1889. You can browse the collection here. It’s well worth a visit; you’ll be amazed by what they have. The 1912 provenance is of course very interesting. Note that you have to be creative with your search queries; Songye is listed as Basonge and the Hungana ivories I found by searching on Bambala. Tip: search on “Umlauff” or “Oldman”. Unfortunately Frobenius himself is never listed as a provenance in this online inventory. UPDATE: I forgot to mention that Yaëlle Biro recently wrote an excellent article on the institution’s rich holdings and collecting history in Tribal Art Magazine (Summer 2013, no 68, pp. 100-117); more info here. 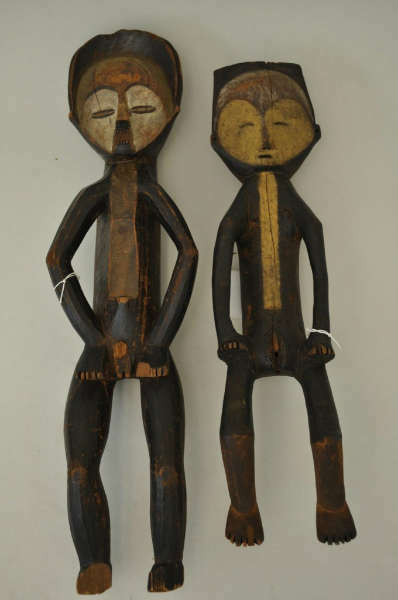 Two Mbole figures acquired from Oldman in 1912. Image courtesy of the Penn Museum. This entry was posted in Museums, Research and tagged Hungana, Mbole on May 26, 2014 by admin. One of the highlights of the upcoming Christie’s sale is the above Luba-Shankadi headrest from the Blum collection. Rudolf and Leonore Blum acquired it 19 years ago (on 4 May 1995) at Sotheby’s New York for $ 46,000. Now, this beautiful headrest is estimated at € 200,000-300,000 – which is a rather low estimate, especially if you know that Sotheby’s sold a similar headrest for € 1,524,000 in 2006 (info) and another example of this workshop in 2005 for € 1,356,000. My first encounter with the work of this sculptor goes back to more than forty years ago, to the mid-seventies, when I compiled the catalogue of African sculpture in Italian museums. In the Museo di Antropologia ed Etnografia in Florence, I began to study a headrest created by a great miniaturist. It was accessioned in 1902, and had been collected the previous year (according to the record of the Florentine institution) in the village of Kicondja on Lake Kisale, by Ernesto Brissoni, Italian member of the Force Public in the, then Belgian, Congo colony. The offered Blum headrest is part of a small group of works to whom William Fagg and Margaret Plass, when studying one of these headrests in 1964, gave the name of “Master of the Cascade Coiffures”, justified by the monumental coiffure with two enormous wings of supreme elegance, which enrich and crown each of its figures. This element, apparently spectacular when seen in reality, was well-noted by the European explorers, who travelled the Western Congolese regions in the nineteenth-century. Today the headrests attributed to a limited group of great artists – no more than three or four – working in the small kingdom of Kinkondja, according to the localization by François Neyt, are eighteen: eleven with a single caryatid; one with a human being riding an animal with very long body and horns (a sort of goat according to Neyt); six headrests with two face-to-face caryatids; four as the previous ones, and two with different coiffures: one in the cascade shape and the other cruciform fret-worked, a typology which relates to the Hemba, eastern neighbours of the Luba. This last work, put on sale for the first time, by Sotheby’s of New York, on 4th May 1995, was collected, according to the information supplied by the owner, by his father in 1907, a year which places the piece in the period of acquisition of the group of documented headrests: Florence 1901, Berlin 1904, Philadelphia (exhibited) 1908, Bulawayo 1910, London 1913. A legend under the base of the carving reads: “Repose nuque – pour preserver la coiffure identique celle de l’objet – pice rare”, i.e. “Headrest – to save the hairdress identical to that of the object – rare piece”. 3 W.Fagg and M. Plass 1964, p. 88. 4 Neyt 1993, p. 177-187. Bassani E., Il maestro delle capigliagture a cascata, “Critica d’Arte”, 1976, fasc: n 148-149, p.75-87. Bassani E., Africa – capolavori da un continente, Firenze 2003. De Maret P., Dery M., Murdoch C., The Luba Shankady Style, “African Arts”, 1973, vol VII, n 1, note p. 88. Fagg W. and Plass M., African Sculpture, London 1964. Neyt F., Luba – Aux sources du Zaire, Paris 1993. Below a rare field-photo showing the aforementioned ‘cascade coiffure’. The Luba-Shankadi hairstyle in the village of N’Gobo. Photographed by François Léopold Michel in 1899. Image courtesy of RMCA, AP.0.0.1227). This entry was posted in Auctions, Objects, Research and tagged Luba-Shankadi on May 26, 2014 by admin. Image courtesy of Galerie Flak. Earlier this year BRUNEAF announced it would participate in the International Antiques Fair in Hong Kong (which runs from 23 to 26 May). Members were given the chance to consign an object from their inventory. You can download a small catalogue here and some pictures of the BRUNEAF booth can be found on the Facebook-page of Galerie Flak. As Henry C.C. Lu writes in his foreword: No matter if in Hong Kong or in Mainland China, tribal culture and art have not as yet been taken seriously. Let us hope this event can change something. Compliments to Bruneaf for trying to break into the Asian market. This entry was posted in Fairs, News on May 25, 2014 by admin. After the Yale University Art Gallery, Getty Museum and Rijksmuseum, the Metropolitan Museum of Art is now also offering high-resolution pictures of objects in their collection free of charge. Cheers for the MET! I hope Paris’ quai Branly & Tervuren’s MRAC are taking note. Thomas P. Campbell, Director and CEO of The Metropolitan Museum of Art, announced on May 16 that more than 400,000 high-resolution digital images of public domain works in the Museum’s world-renowned collection may be downloaded directly from the Museum’s website for non-commercial use—including in scholarly publications in any media—without permission from the Museum and without a fee. The number of available images will increase as new digital files are added on a regular basis. OASC was developed as a resource for students, educators, researchers, curators, academic publishers, non-commercial documentary filmmakers, and others involved in scholarly or cultural work. Prior to the establishment of OASC, the Metropolitan Museum provided images upon request, for a fee, and authorization was subject to terms and conditions. More info on the Open Access for Scholarly Content (OASC) can be found here. Available objects now have a small OASC marking underneath the image on its online collection page, as well as a download arrow. Unfortunately, with the exception of all objects of the old Benin Kingdom, not a single African object features this marking – at least for now. This entry was posted in Museums, News on May 24, 2014 by admin. Dear readers, just back from a 10-day trip to NY – apologies for the lack of posts. A review of the two Sotheby’s sales is following. In the meantime the catalogue of the next Sotheby’s Paris auction (on 18 June 2014) can already be found online here, as is the one from the next Native sale in Brussels (on 7 June 2014). This entry was posted in Auctions, News on May 23, 2014 by admin. Mislabeled as a “Nkishi” female power figure, the Bassa figure from Liberia above will have caused some surprise in a small US auction room yesterday. Estimated at $ 5.000-8.000, and starting at $ 2.500, it sold for $ 75.000 ! It could have been a sleeper, but it was obviously discovered by several parties. A figure by the same hand was recently published by Galerie Schoffel-Valluet, in Côte d’Ivoire – premier regards sur la sculpture, 1850-1935 (on page 109). A rare object. Hopefully, more auction surprises next week in NY ! This entry was posted in Auctions, News and tagged Bassa on May 11, 2014 by admin. We recently learned (here) that a new museum for non-European art will be opening in Milan later this year, but also Barcelona will be getting its own Museum of World Cultures. The Museu de Cultures del Mon will open in early 2015. It will be located in the gothic palaces Nadal (which until 2012 contained the Barbier-Mueller Museum of pre-Columbian Art) and Marquès de Llió, in the historic Montcada Street of Barcelona (across the Picasso Museum). The museum will display around 700 objects from Asia, Africa and Oceania and is based on the 2,300 objects on loan for a period of 20 years to Barcelona City Council from the Folch Foundation, as well as a selection of objects from the non-European collections of the Ethnological Museum of Barcelona and other important collections from across Spain. Of its 2.100 square meters, 1.300 will be occupied by the permanent collection and 300 by the temporary exhibitions. Learn more about it here. Fang-Okak figure. Image courtesy of the Museu de Cultures del Mon (#71-5). This entry was posted in Museums, News on May 10, 2014 by admin.